Ketel One® Vodka, the world’s leading vodka, launched its inaugural Chicago’s Modern Hispanic Gentlemen (MHG) People’s Choice Award, a new exploration of the series taking place at www.modernhispanicgentlemen.com, where online community voting from Feb. 1-Apr. 15, 2013 will determine Ketel One’s third Modern Hispanic Gentleman. Ketel One has selected three finalists for the honor: Nicholas Delgado, Jose Luis Velazquez, and Ivan Vega. To learn more about the MHG program or the nominees, visit www.modernhispanicgentlemen.com. NICHOLAS DELGADO is an entrepreneur, investment expert, coach, speaker, strategic advisor and technologist. He founded Dignitas to provide clients with personalized, high-quality advice and solutions. With more than 15 years of experience in the financial services and wealth advisory industry, Nick has become a go-to advisor for start-up entrepreneurs as well as seasoned executives. Dignitas gives back to the Hispanic community through its “Coach for Growth” program, providing small businesses with coaching, growth evaluations and the opportunity to showcase their businesses before a number of potential collaborators. JOSE LUIS VELAZQUEZ is a military veteran who served for 10 years in the Air National Guard before being honorably discharged in 2003. Jose is deeply inspired by his military service and re-enlisted in the Army Reserve in 2008. Currently an American Airlines flight attendant, Jose is also pursuing his higher education at Northeastern University, where he supports military efforts as a member of the Veteran’s Club. 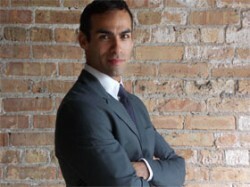 IVAN VEGA is co-founder and executive director for UrbanTheater Company (UTC) and a notable Chicago actor. Since 2005, UTC has produced cutting-edge theater while creating opportunities for Hispanic actors to make theater accessible in the barrio. Ivan utilizes theater and the arts as a vehicle to educate and inspire change within the community. UTC provides free shows to his community’s disadvantaged population as well as opportunities for up-and-coming actors to serve as apprentices.